Welcome to the Vintage Powder Room Cinema! Today’s feature is THE LEMON DROP KID starring Bob Hope, Marilyn Maxwell, Lloyd Nolan. It’s a different sort of holiday tale. 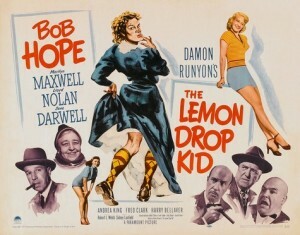 Damon Runyon’s old story, “The Lemon Drop Kid,” which, was about a race track tipster who leaped from the frying-pan into the fire, has been given a pretty thorough shakedown under the capable hands of Bob Hope in the slapstick farce of the same title that came to the Paramount yesterday. The consequent entertainment, populated throughout by Mr. Hope, may be a far cry from Mr. Runyon’s story, but it’s a close howl to good, fast, gag-packed fun.